White-Tip Spiders love to hide out in bedding and clothes which have been left on the floor. White-Tip Spiders love to eat other poisonous spiders and is nature’s way of pest control when it comes to poisonous spiders. White-Tip Spiders are active at night and will sleep under rocks, logs, leaves and in bushes in the day. White-Tip Spiders are wanders and do not build webs but will stalk its prey and wait for that perfect moment to catch it. Female White-Tip Spiders lay around 80 to 100 pink eggs and will guard her eggs until it hatches. 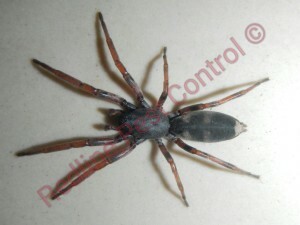 It was once thought that the White-Tip Spider bite caused necrotising arachnidism which is a flesh eating bite but this has been proven in recent times that it is not true. White-Tip Spiders will only bite if it feels threatened or provoked. White Tip Spiders have special little hairs which allows them to walk on any surface including glass. Female White-Tip Spiders are large than the male White-Tip Spider with the female being around 18mm and the male being around 12mm.